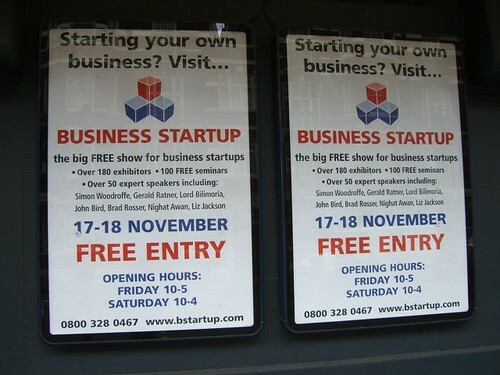 If you’re expecting shiny suits and ‘Get Rich Quick’ schemes, you won’t be disappointed by the Business Start Up exhibition and conference that’s on today and tomorrow at Olympia in London. The Erotica Show is also in town at Olympia this weekend so you really can mix business with pleasure. The chances are that you won’t be drawn in to taking on a smoothie franchise or be taken in by the woman who will teach you how to be a property millionaire with little risk. When I visited this morning Gerald Ratner was delivering a speech which should have been called “Je Ne Regrette Rien: Destroying My Business was the Best Thing I ever Did” and it was standing room only, so maybe I was missing something. Others were lapping it up. There are dozens of stalls from free websites, sorry, ‘online solutions’ right through to the Yellow Pages and Trevor Baylis (legendary champion of the wind-up radio). A lady on the Yellow Pages stand dismissed my suggestion that the nation’s favourite big yellow doorstop was bound to die by robustly informing me that the “print run is bigger than ever.” But are more people using it? “It’s impossible to measure.” She cheerily retorted and handed me a leaflet. You won’t get out without a ream of leaflets, which will be forced on you whether you want them or not. And yes, there are the obligatory short-skirted dollybirds handing out the info. One sweetly asked me to take a leaflet because she had hourly targets to meet and it would help. Happy to oblige, we got chatting. She wasn’t long in Britain from down under, this was her first job over here and it was cash in hand, no questions asked. So much for business ethics. It’s free to get in and if you can face the army of leafleteers thrusting brochures and flyers in your face there are some good reasons to attend. Business Link is there with an army of advisors so it’s a good opportunity to find out what they can offer you. HM Revenue and Customs are there too and dismiss the expectation that they’re curmudgeonly and snivelling: they actually have a lot of useful stuff and courses they’re offering free. I found them very helpful with the questions I had. But for next year here’s a suggestion: a recycling bin on the way out.